Is it Wednesday and you feel tired already? Then log into your account at Vinnare Casino and let them put a smile on your face with this incredible deal. The promotion is valid every Wednesday until 30th of January. 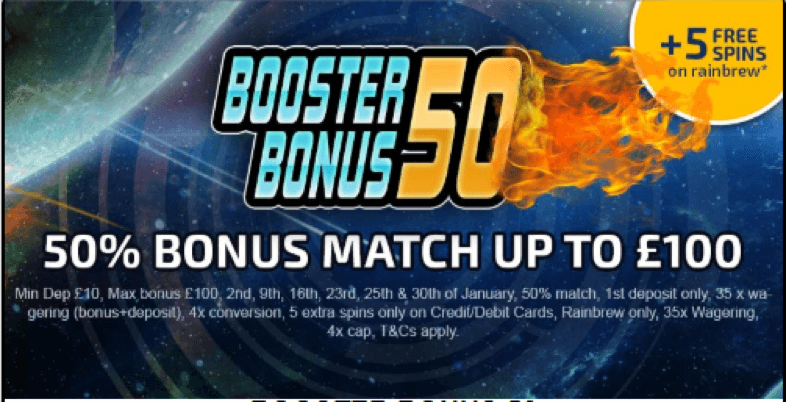 After making a deposit over £10, you can claim a 50% match bonus up to £100. 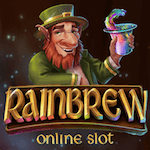 Also, if you choose to fund your account with Visa, Mastercard or Maestro, you will receive 5 bonus spins valid only on Rainbrew. As long as you respect the wagering requirement of 35 times the sum of the deposit and bonus amount, you can cash out. Play through the winnings from the spins 40 times prior to any withdrawals. The maximum conversion from the bonus funds is limited at 4x. 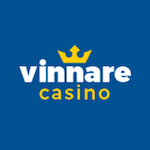 Make your days better and your gambling sessions more entertaining at Vinnare Casino! Join this incredible platform and you will find out how it feels like to be excited every day. Create an account using the registration form and without making any payment, you will get 10 extra rounds on Starburst after your mobile number is validated. You can spin the reels on Starburst for 7 days, the time period when they are valid. For any cash-outs to be possible, you have to wager the winnings from the spins 100 times. Take into consideration that the spins worth 20p each and the additional funds credited are valid for 28 days. Wager the deposit plus the bonus amount and the winnings from the spins 40 times prior to any withdrawals. Make the most out of this deal and don’t forget that the withdrawal from the two offers is limited to 4x the bonus amount. This is the moment you've been waiting for - are you up for the challenge? Then gear up and boost your deposit at Vinnare Casino! Create an account on Vinnare Casino and prepare for a veritable gaming session. On this website, you will be delighted by an optimized mobile version, an intuitive interface, and a unique VIP programme. As soon as you become a member, you will be welcomed with a top-notch first deposit bonus. In order to claim it, you need to make a deposit over £10 and you will get a 200% match up to £50 plus 50 extra spins on Starburst. Take into consideration that for any cash-out to be possible, you need to wager your bonus and deposit 40 times, plus 40 times the winnings from the spins. Also, the conversion from the bonus amount is limited to 4x. 10 spins - On Registration, opening your path to a world of surprises! At Vinnare Casino online every new player has the opportunity of beginning its gambling journey in great style. As soon as you become a member, you will benefit from a no deposit deal and many other goodies that will simply amaze you. The maximum conversion that is 4 times the bonus amount. Let’s kick it up a notch and start spinning at Vinnare Casino online gaming platform! Keep the fun alive at Vinnare Casino by logging into your account and making a second deposit. All British members can claim a 100% match offer up to £200. In order to make any withdrawal possible, you need to wager the sum of your deposit and bonus amount 40 times. Also, the maximum conversion from the bonus is capped at 4x. Are you a serious online player? Then this is right up your alley. Complete your Welcome Package offered by one of the most attractive online casinos. Vinnare Casino waits for all its existing members to make their third deposit and have fun with a 50% match bonus up to £250. Take a look at the Terms and Conditions section to find out what games are valid for this promotion. Moreover, for making any cash-outs possible, you have to respect the wagering requirement of 40 times the sum of your deposit plus the bonus amount. The maximum conversion from the bonus amount is limited to 4x.